The sub-group for this initiative has been exploring ways to make immigrants in Needham feel welcome and to have their cultures embraced by the wider community. The opportunity for the Task Force to move in this direction came with the offer of the Needham Community Council to mail an invitation from the Task Force to its English-language tutors who, in turn, invited their students to join them for what to date has been four events. At the potluck event at least eight countries were represented, including China, Iran, Syria, Russia, Ukraine, Israel, Myanmar, England and the U.S. As people arrived, each person put a sticker on a large map indicating the country of her/his origin—or ancestral country. We then moved from one easel to another, each easel bearing newsprint with a word in English at the top, including the words Hello, Welcome, Family, Friend and Smile. Attendees then wrote below the English word the same word in his/her language of origin. Following these icebreaker exercises we gathered at the potluck table to fill plates with delicious foods from the different cultures. Small group discussion took place informally at the tables, with those with better language skills interpreting for people with less developed language skills. The first event in 2015 was a potluck/music event. 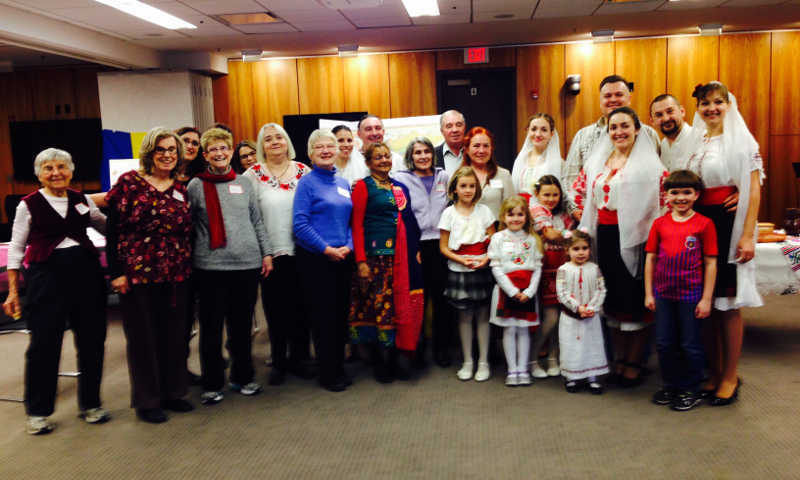 Good food, laughter, dance and songs were enjoyed by the 40 guests at the Welcoming Needham event on March 29, 2015. The Chambers Street Community room of the Needham Housing Authority was transformed into a dance and music studio for 2 hours. Guests and hosts learned the Hokey Pokey, enjoyed traditional Chinese songs and attempted to learn Middle Eastern folk dances. All while enjoying snacks from all over the world. This event was co-hosted by the Needham Area Immigration Justice Task Force and the Needham Housing Authority. Join us in the Fall for another Welcoming Needham event. Attendees at these events were enthusiastic about their experience and willing to come to future events. The Task Force intends on offering regular gatherings in the future, as well as, inviting new members to join the Welcoming Needham Initiative. Participate in planning for future events that will promote us as a more welcoming community. Seek out immigrant people in your wider neighborhood to help them meet other longer-term residents and to invite them to neighborhood activities. Become an English tutor through the well-planned and executed Community Council program. Join with the Task Force to promote activities designed to make ours a healthier, more inclusive community for all of its residents.